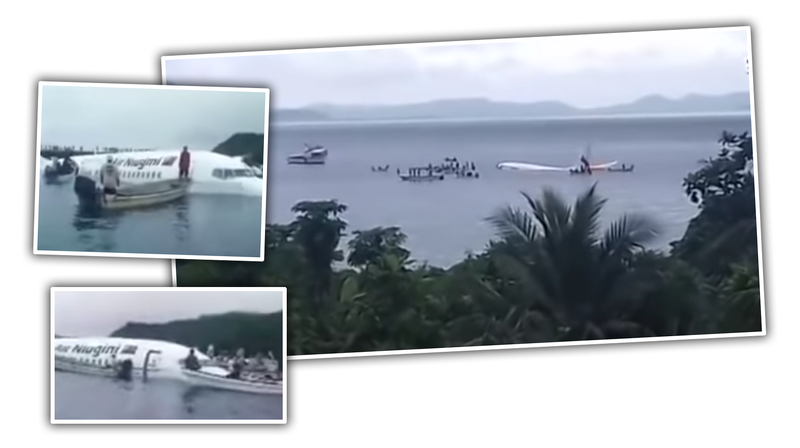 Early this morning an Air Niugini Boeing 737 overshot the runway coming into Chuuk Island in Micronesia, and ended up crash-landing in a lagoon. Thanks to the efforts of local boaters who came to the stricken aircraft’s aid almost immediately, all 47 passengers on the plane are safe. While it is not clear exactly what went wrong with flight PX 073 as it came in to land at the Chuuk Island airport after its flight from the Micronesian island Pohnpei, the pilot was able to come to a fairly controlled landing on the water, reminiscent of the famous landing on the Hudson river in New York by pilot Chesley Sullenberger. The flight proceeded normally until final approach to (presumably) runway 04 at Chuuk Airport, Weno Island, Micronesia when the weather conditions deteriorated. According to eyewitness accounts and local media reports, the aircraft descended below the proper approach path until it hit the water surface ending in the lagoon approximately 200 m from the beginning of the runway. The plane suffered a hole in its side and a buckled fuselage and was rapidly taking on water, which could have been a disastrous situation if not for the bravery and immediate response from local boats, a common form of travel in the island nation.